Nikon D3400 DSLR (with AF-P 18-55mm VR Kit Lens) is your pathway from being an amateur to a professional photographer. Be prepared to get those breathtakingly beautiful photos with this perfect set of camera and lens. If you are a person who believes in the fact that first and the foremost investment in photography has to be in your skill, and then your camera. This is certainly a camera made tailor-made for you. 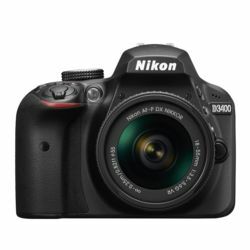 This DSLR is adorned with Nikon SnapBridge Connectivity using which you can connect your DSLR to your phone via a constant Bluetooth Low Energy (BLE) connection and instantly transfer, share your photos with the world! Snapbridge also allows you to access your D3400 when it is switched off! Capture all those precious moments of your life in accurate life like colours even in low light courtesy to its improved ISO range of 100-25600. And of course the 24.2 MP image sensor with the expeed 4 image-processing engine plays a huge role in this. Be it a novoice or a professional person, the ease of controls and handling that is felt while using this camera is what makes it a loved piece of technology all over the world. Buy this Ultra cool DSlR camera with HD recording capabilities at an equally cool price here only on Infibeam! Nikon D3400 DSLR (with AF-P 18-55mm VR Kit Lens) is your pathway from being an amateur to a professional photographer. Be prepared to get those breathtakingly beautiful photos with this perfect set of camera and lens. If you are a person who believes in the fact that first and the foremost investment in photography has to be in your skill, and then your camera. This is certainly a camera made tailor-made for you.Click. Connect. 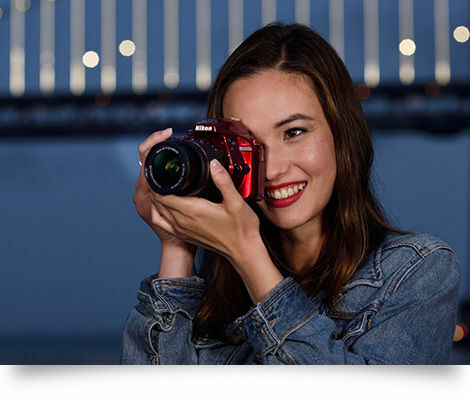 Share!This DSLR is adorned with Nikon SnapBridge Connectivity using which you can connect your DSLR to your phone via a constant Bluetooth Low Energy (BLE) connection and instantly transfer, share your photos with the world! 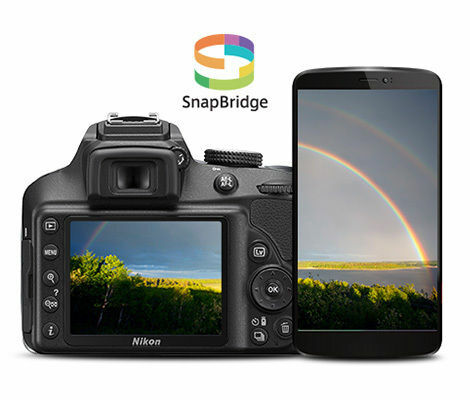 Snapbridge also allows you to access your D3400 when it is switched off! Supreme Picture QualityCapture all those precious moments of your life in accurate life like colours even in low light courtesy to its improved ISO range of 100-25600. And of course the 24.2 MP image sensor with the expeed 4 image-processing engine plays a huge role in this.Easy to Use!Be it a novoice or a professional person, the ease of controls and handling that is felt while using this camera is what makes it a loved piece of technology all over the world. Buy this Ultra cool DSlR camera with HD recording capabilities at an equally cool price here only on Infibeam! NEF (RAW) + JPEG: Single Photograph Recorded in both NEF (RAW) and JPEG Formats"
Compatible Lenses "This camera supports autofocus with AF-P and type E and G AF-S lenses only. Type G or D AF NIKKOR not equipped with an autofocus motor: all functions supported except autofocus."